Impressive People helps state schools build links with successful former pupils who wish to encourage young people following in their footsteps. The charity’s founder, Patrick Gaffney, is a highly experienced teacher who has written extensively for both primary and secondary schools. 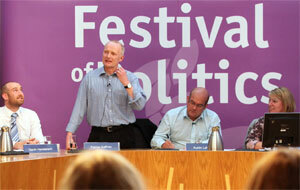 Patrick remains Director of the charity and is shown here addressing an audience at the Scottish Parliament on the subject of young people and the legal community. Impressive People began in Scotland but is now active throughout the UK following many requests from teachers in England, Wales and Northern Ireland.